William Shakespeare made these lines immortal in his legendary tale of star-crossed lovers named Romeo & Juliet. The question within the quote (“What’s in a name?”) is still regularly used today as a popular adage expressing the point that the name or label we put on things or persons may vary, but these can still accurately describe the subject at hand. Simply put: “It is what it is” and “You are what you are.” Ironically, a perceived “ladies’ man” of today is often labeled as a “Romeo,” and defined as an attractive, passionate male seducer or lover. I’m sure Shakespeare would be proud! It’s all about perceptions and connections—finding, making and understanding these between things, places and people. That said, I’ve chosen to name this history-based freelance/consulting business of mine: History Shark Productions. It's really nothing more than a fancy synonym forChris Haugh Productions, but there is a rhyme and reason for this which I will get to shortly. And just in case you were wondering, the rationale is not because the domain name for Chris Haugh Productions was already taken. I was amazed to Google it for myself, and several articles/references to me seem to appear in the search results. A very good problem to have. My middle name is Edwin. This was my father’s name (Edwin Albert Haugh, Jr.), and also my grandfather’s name (Edwin Albert Haugh, Sr.) Unfortunately, I have not been able to trace the origin back earlier as my great-grandfather in this genealogy branch was Ambrose Albert Haugh, son of Jason Ambrose Haugh, an Irish immigrant who came to America in the 1870’s. So I guess it’s conceivable that I could have received the middle name Albert or Ambrose if Edwin hadn’t have been favored in my case. In doing research, I discovered that one of my great-grandfather’s close work associates was named Edwin—perhaps this is the origin? She replied that it couldn’t be gender specific. She laughed and agreed that I had successfully met the requirements. The name stuck, and would continue through infancy into our child’s toddler years. That was over nine years ago, and my son, Edwin Sebastian Haugh, still sleeps with a plush 18” stuffed animal shark that he received at birth, aptly named “Sharky” as well. The personal nickname of “Sharky” has fallen by the wayside and Edwin is commonly known to most friends and relations as “Eddie,” just like my father was called by anyone knowing him before adulthood. When my dad finished school and entered the working world, he preferred “Ed.” Sadly, Dad never got to meet his grandson Eddie as he died two years before the latter was born. Interestingly, my Eddie looks very much like his namesake, including his brownish-red hair, freckles and fair coloring. My father’s favorite activity was going to the beach—same as my young son, and myself for that matter. I truly feel the “bridge of life” concept, buttressed on both sides by Eddie Haughs. How did my son come to acquire the middle name of Sebastian? I wouldn't be wrong in simply saying, "It's French!" The name, however, is not attributed to St. Sebastian, the famed martyr, nor does it pay homage to the great English film and television actor Sebastian Cabot. Ironically, Cabot is best known for his role as Mr. French on the sitcom Family Affair (1966-1971). Sebastian is the surname of a devoutly Catholic French ancestor in this case, my paternal GGG Grandmother from Alsace-Lorraine who arrived in America in 1852. At the age of 19, Catherine Sebastian had left a battered homeland behind, one contested regularly by both France and Germany. Family lore says that Catherine and her sister dressed as boys in an effort to smuggle their father and uncle out of their country en-route to the US. The Sebastian family would escape and disembark in New York City. Her sister would remain there, while a brother reportedly traveled west. Catherine eventually came to Delaware, perhaps in an effort to find work, or simply accompanied her future spouse. Relatively little is known about the Sebastian family as more concentration over the years has centered on her husband and his journey to America from Herborn, Germany. In 1857, Catherine Sebastian would marry Wilhelm Koch, a fellow immigrant who also arrived in New York City in 1852. I have always known a great deal about this gentleman as my father was the family keeper of Koch's original travel papers, which have since been handed down to me. From these, I have a physical description of the man, and have subsequently researched and found his US naturalization papers in the National Archives. For relatives of the Cook (anglicized from Koch) family line, Wilhelm has always been the famed family progenitor, encouraging pilgrimages to his sacred gravesite as a genealogical "rite of passage." Wilhelm Koch was a carpenter. In 1855, he followed three brothers who had come to Delaware City, Delaware to work in the construction of Fort Delaware on Pea Patch Island, a strategic US Army defense facility located in the Delaware River. Unfortunately Wilhelm only lived a decade in his new home country. He died of smallpox in April 1862, likely contracted at the fort and its growing population of imprisoned Confederate soldiers during the Civil War. Fort Delaware, the famed Union Army fortress and prison camp in the middle of the Delaware River off Delaware City (DE). Painting by Seth Eastman. Early visit to the gravesite of Wilhelm Koch in summer of 1976 by Haugh brothers (L-R, Jonathan, Chris and Tim). It's easy to see that we dressed ourselves appropriately for the occasion. Wilhelm's passing left wife Catherine Sebastian (Koch) Cook with two toddler boys to raise (ages 4.5 and 1.5). She would give birth to a third child, a daughter named Elizabeth Anna, in June, 1862, two months after her husband’s death. She raised all three children into adulthood, never remarrying. Special attention had to be given to daughter Elizabeth who, at age four, endured an unfortunate fall that crippled her for the rest of her life. Catherine made ends meet by working, first as a cook and laundress at Fort Delaware. A few years later, she “labored” as a midwife, a job that enabled her to buy a house in which to raise her family. Later in life, she operated a small general store out of this house’s front parlor. Catherine’s two younger children remained in the family home into adulthood. Daughter Elizabeth, finally able to walk at age 16, greatly benefitted from her mother's care. Son John Cook, my direct relative and GG grandfather, married at age 30. His new bride Emma would move into this home and bring six more children over the next ten years—all delivered in part by their midwife grandmother Catherine. Speaking of names, my great-grandmother was given the name "Zitta," which appears to mean happy state, young woman. Divine provenance would come into play, providing Catherine, the "French Rose," with a new, yet familiar life role in 1901. Her daughter-in-law Emma (my GG Grandmother) died of whooping cough at the age of 39—ironically the same age I began parenting. Catherine unselfishly helped her son John raise these grandchildren into adulthood. Both mother and son were aided by “Auntie,” Elizabeth Cook. Yet another tragedy would beset the family in April, 1908, when 13 year-old grandson John Cook was accidentally shot and killed as he stood harmlessly in the front parlor store area of the family home. This story made newspaper headlines up and down the East Coast, and certainly called Catherine's strength once again to hold the family together. After an investigation, it was found that the bullet came from the gun of a gentleman who was hunting along the canal. Catherine Sebastian Cook (back row left) and her grandchildren in 1901. She is joined by "Auntie" Elizabeth (back row right). young John Cook to Elizabeth's left and Zitta is seated (first row left) in front of her grandmother. Catherine Sebastian Cook died in early May 1912, at the age of 73. She never won any medical awards, her "general store" business model didn’t franchise, no books have been written about her—just an average life filled at times with challenges, but one of happiness and optimism. 14th Annual Cook Cousins Picnic at Sam Green's Beach, Port Penn, Delaware in the summer of 1968. New family member Chris Haugh (age 1.5) is held by his father underneath the sign as his grandparents and mother stand to the right. Wilhelm Koch Ieft his lasting legacy with the family surname. However it was actually Catherine who gave the Cook name such special meaning to me and countless relatives over the past 150 years. She is responsible for the family's personality and loving nature, thanks in part to her life's example. I have always marveled at the close knit relationship my father shared with his extended family of "Cook" cousins. His father, a transplant serviceman from New Jersey had been equally embraced, after marrying into the family. 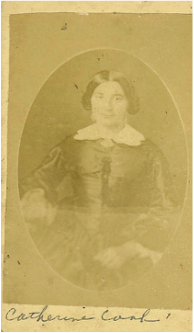 This was a regular occurrence as many Cook family girls, including Catherine's three granddaughters, married soldiers once stationed at Fort DuPont, a military installation directly across the canal from their home on East 5th Street in Delaware City. This family culture was magical, something clearly evident through the four generations that followed Wilhelm and Catherine’s union back in the mid 1850’s. Many of those descendants still live in Delaware City to this day, others are spread around the country. I was able to experience the Cook Cousin spirit first-hand through family reunions, summer picnics, Christmas parties and even sad occasions such as post-funeral receptions for members who had passed on, including my own father. History Shark Productions is the name I have chosen for my business handle. I know that you don’t often see sharks researching, writing about the past, or giving lectures. Rather the stereotypical view of this fish consists of them ending people’s lives, not documenting them. All this aside, sharks, like history, are perceived differently by different people. But most experts concur that these are interesting animals, and can commonly be defined by the term voracious: meaning enthusiastic, eager, keen, avid, desirous, hungry, and ravenous. Now maybe the adjective “ravenous” may be a bit strong, but when it comes to assisting others with interpreting, understanding and documenting history, I can honestly describe myself as voracious—but always friendly and even-tempered, mind you. Whatever the project or activity, you will find in me an eager approach and committed passion. So between my love of history and storytelling, coupled with my son’s "prenatal nickname," and a multi-generational adoration for the beach, the name just seems to fit perfectly. Besides, it’s certainly more creative than Chris Haugh Productions. There's plenty in a name!